"Charge them that are rich in this world, that they be not highminded, nor trust in uncertain riches, but in the living God, who giveth us richly all things to enjoy." Today, I thought I'd lighten up the subject matter a bit and write a fun post, instead. I love learning more about the bloggers I follow and thought perhaps you may enjoy that, too! So, here are a few of my favorite things. #1. 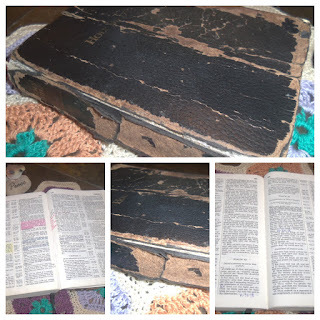 My dear, old, trusted Bible. Its cover is tattered and torn, the pages are well-marked and highlighted from over 31 years of use, the hours we've spent together are many, and I wouldn't trade it for all the money in the world. It is still the Bible I regularly read, and my most precious earthly possession. #2. Spending time with Jesus. One of my favorite things to do is pray, and one of my favorite places to pray is outside overlooking the river. It invites me to get real quiet before Him—still enough to clearly hear His voice. I love to pray out there at night, too. Even though I can't see the river, I know it is there. I can hear it gently flowing, its calming movement mixing with other sounds of the night. 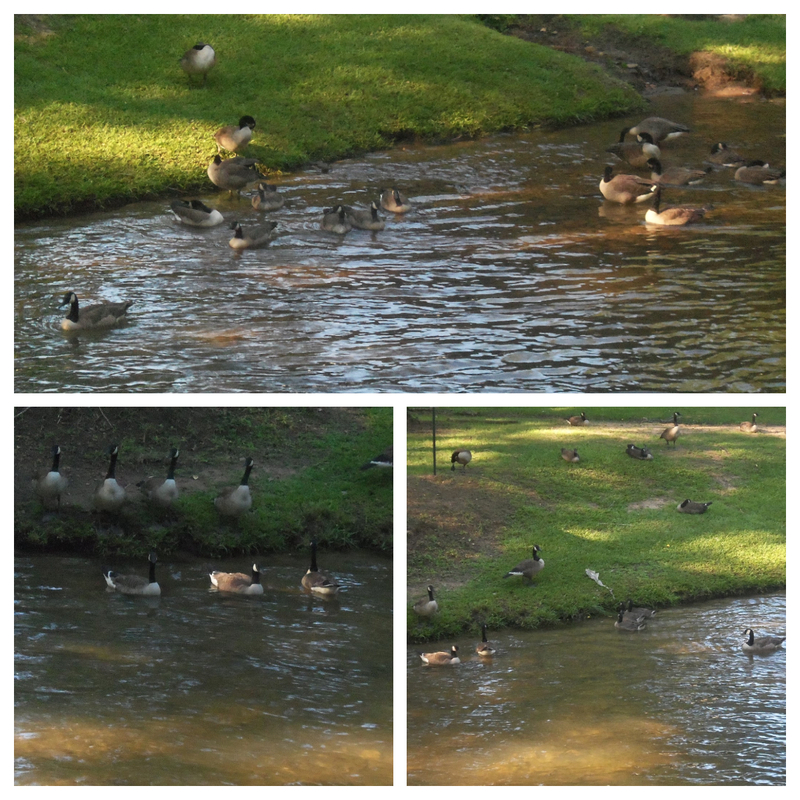 Speaking of the river, we have been enjoying getting acquainted with the goose family that has been gracing us with visits this spring and summer. There's a mama, a papa, and six little babies. It is fun to watch them grow. Each time they drop by for a visit and bread or crackers, they are a little bit bigger. 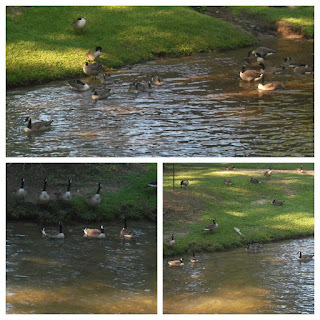 They haven't stopped by for several days, but we've spotted them visiting other spots in the neighborhood while we are out and about on our daily walks. #3. Walking through life with the dearest man and sweetest boy. One of the most precious blessings of my life is getting to share each day with Kevin and Zach. 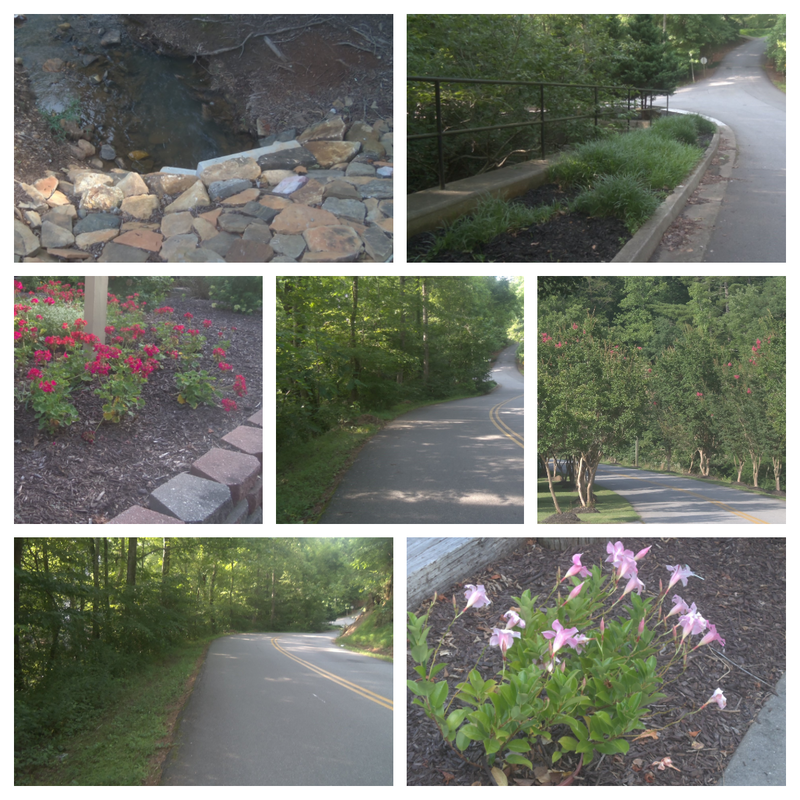 This is what we see on our walks together. 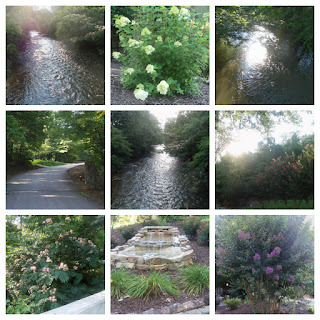 The serenity of the mountains and the river draws me in, and it is not at all unusual for the praise in me to well up and burst forth in the form of, "How Great Thou Art!" Yes, I have been known to sing it as we walk, and there may or may not have been people around. God has done SO much more for me than I will ever deserve. How can I keep from singing? #4. 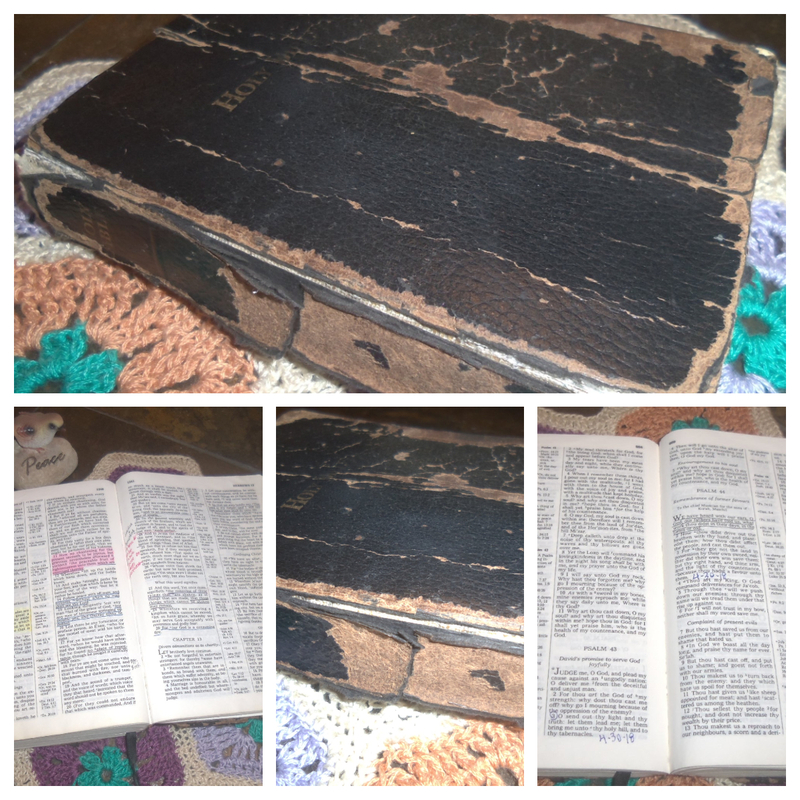 Recently, dear, sweet Zach spent his own money and surprised me with a Wonder Bible! I was so deeply touched by his thoughtfulness and generosity. Zach is so precious. 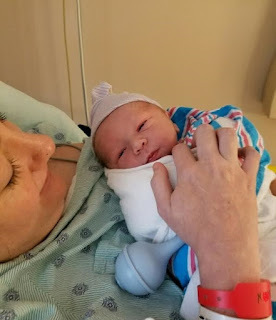 I will never, ever, ever stop praising God for sending Zach to us right when He did and for allowing Kevin and me to finally have a child of our own and to be Zach's parents. This Wonder Bible is downright amazing. It has already proven to be such a blessing to me, and I love to listen to it as I am going to sleep. What a sweet and perfect gift! Thank you, dear Zach, from the bottom of my heart! This truly is a powerful tool in helping me stay on track, both spiritually and physically. If you haven't downloaded your FREE copy yet, please click here, and help yourself! I keep my P.O.W.E.R. Tool© on the table next to my recliner, so I am continually reminded throughout the day to pray, reach out to others, drink water, exercise, and read my Bible. I hope you will try it and see how much it helps to motivate and inspire you, too! I cannot say enough good things about this stuff! I had tried it several years ago, and then I got slack and stopped ordering it. I didn't realize how much it was helping me until I stopped taking it. Recently, I started back on it, and boy, can I tell a difference!! It keeps my hunger at bay and helps to regulate my sugar levels, but the best part of it is that it gives me energy and just makes me feel better. we would be ever so grateful for your support! Just click HERE to place an order! Better yet, I hope you will consider becoming an ambassador, too! The discounts are worth it! If you're interested, please drop us an email. Since I am trying so hard to lose weight, (you can read about it here where I share about facing obesity head-on), along with taking Plexus Slim Pink Drink every day, I am closely monitoring my carb intake. This means I had to pretty much totally give up honey. 😢 BUT, never fear! THM Gentle Sweet is an answer to my sweet cravings. I started using it a few months ago, and it has become my new go-to sweetener. It is healthy, too, (NO aspartame~it is Stevia-based), and the flavor is amazing with no bitter aftertaste. Hooray! As I may have mentioned, I am trying SO hard to lose weight, and part of my commitment to The P.O.W.E.R.© Tool is to drink a personally-specified amount of water each day. This handy-dandy insulated water bottle is an amazing help! It was a gift from my niece, Kristen, the one so many of you helped to pray through her pregnancy last year. (You may remember that she had a blood clot in her lung throughout much of her pregnancy, and there were so many scary moments. 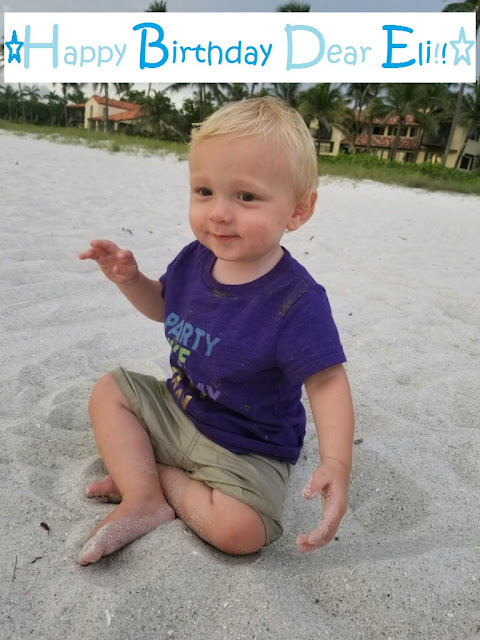 But, God in His infinite mercy and faithfulness pulled her and her precious baby, Eli, through, and he is now one year old!) Kristen gave this gift with the intention of it being Kevin's Christmas gift last year, but shamefully, I hi-jacked it shortly after it arrived in our home!!! It is just wonderful! It keeps my water cold for HOURS, I kid you not. I can fill it with ice today, and by tomorrow morning, the ice has not melted. I LOVE this thing! Okay, I am sure by now, you are wondering about its name—Therma-Lou. Well, that, my friends, is a long story, and I wanted to catch you before you start storming Google with questions like, "Where can I buy Therma-Lou?" Let me explain. My goal is to take water with me wherever I go so I can keep up with my water drinking commitment throughout the day. I am forever forgetting "her" and calling out things like, "Zach, would you mind grabbing my drink-thermos-water-thing on your way to the car?" So, we decided it was time this little beauty be given a name all her own. Barney Fife and his girlfriend, Thelma Lou, came to mind, and I got this bright idea to alter her name just a bit, replacing the "L" with an "R" and name our water bottle in her honor. So, there, you have it! The ever faithful, Miss Therma-Lou! I don't know about you, but I can quickly become bored with drinking plain water. So, to keep things interesting and to make sure I stay on track with my water drinking each day, we started buying these super-handy flavoring packets. I just fill "Therma-Lou" with ice, open a bottled water and mix the flavoring packet in, then pour it over the ice. I prefer not to use the ones with artificial sweeteners but will use them in a pinch. The brands I love most are True Lime & True Lemon. They are sweetened with Stevia, and you can buy them at Walmart. They are delicious and really keep me motivated to keep drinking water. I LOVE being able to record as many check marks as possible on that P.O.W.E.R. Tool© sheet at the end of the day! If you've been reading here for very long at all, you probably already know that I love coffee! I am always on the search for great-tasting, rich, bold-flavored coffee that packs a powerful punch. And, there is this certain quality that I look for in a coffee taste—I hardly know how to describe it, but it has to leave a certain strong coffee aftertaste. Does that make sense? I have mentioned The Spice Merchant's coffee here before so you may remember how crazy I am about it. (Get it, Jamaican Me Crazy? Never mind. 😂) This coffee is out of this world. Today, I also wanted to mention another coffee company that we were just recently introduced to. Let me just tell you that I've been drinking this coffee every day, and it is amazing! Oh, the aroma! When you open the bag, you can't just take a quick, little sniff. You have to inhale—deeply—and linger. The scent is wonderful, but only a small glimpse of the flavor to come! And don't you just love the name? The antique coffee canister in the photo is a cherished, long-ago gift that Kevin bought for me during one of our times antiquing. I love the way it looks, but I mostly love it because Kevin bought it for me. The pretty mug was another gift from my niece, Kristen—yes, this mug was actually intended for me! I love the mug so much. It has become my favorite, and I think of Kristen every day when I use it. As you can see, I love to combine some of my favorite things and pray outside by the river while sipping a cup of fresh-made coffee. The words on the mug say it all! Oh, my, I love my Keurig so much! Kevin and Zach bought it for my birthday last year, and I can't begin to say how much I enjoy using it each day! It gets a workout and keeps on brewing! When it comes to coffee taste quality, there is no substitute for buying whole coffee beans and grinding them fresh. In order to ensure the best quality of freshness, I usually only grind enough coffee beans to last for about 2-3 days at a time. This little appliance is a gem! It is the perfect size and so easy to use! After I grind the beans, I store the grounds in the antique coffee tin. It just makes me smile. I love making coffee for Kevin and Zach, too. They like flavored creamers and enjoy trying different ones. I stick to a limited amount of 1/2 & 1/2 in mine. There is only ONE gram of carbs in 2 Tablespoons of the Walmart brand! YEAH! I feel like a professional barista whipping up a coffee treat for each of us every afternoon! Those little things in life mean a lot everything. We've been collecting old, antique jars for many years. As you can see, we love to make daily use of them and not just keep them for display. Since we have started an intense minimizing journey, possessions that earn the right to stay in our home have to meet one of three requirements—we have to either need, use, or enjoy them. We got rid of a lot of our old jars, but we held on to certain special ones, and we are finding ways to bring new life to them. You may have noticed that we store our THM Gentle Sweet in an old, blue canning jar. I simply cut the label off the plastic bag and taped it inside the jar, to identify the contents. We use old, blue canning jars to store several things inside our kitchen cupboards and outside, too, including a way to display pretty marbles. Oh, my! I wish there was a "sniff here" button on your computer screen!! Kevin and I recently celebrated our 30th year anniversary! YES, I said 30 years!! Oh, God has been SO good to us. We praise Him from the bottom of our hearts. Kevin spoiled me and was so kind and thoughtful, as always. This McCall's candle was one of my anniversary gifts, and I have been enjoying it ever since. The fragrance of this one is "State Fair," and I can't even describe how wonderful it smells. It permeates throughout the whole room and is just amazing. During our minimizing, we have let go of about 90% of our possessions and moved to a much smaller living space, but we have chosen to keep the things that fill our home with comfort and a sense of peace and add value to our everyday lives. Things like this darling "Homespun" box dear Zach recently bought for me. Isn't it just adorable? The word "homespun" caught his eye and made him think of Homespun Devotions, and he, of course, is well acquainted with my weakness for quilts and anything primitive or old-looking. #16. Dad's old banjo & bluegrass music. Some of my sweetest childhood memories have to do with the times my dear Daddy took out his five-string banjo and played for us. 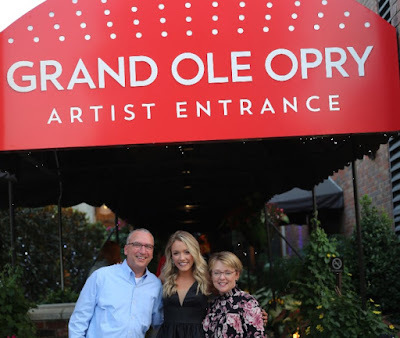 Many a family get-together was centered around music, and from my earliest childhood memories, I can recall singing that high lonesome sound Vince Gill sings about. So many who were in those gatherings have been called home to Heaven, and the void they left behind will never be filled. I could easily burst into tears each time I hear certain songs or a banjo playing. When I was in 8th grade, Mom and Dad bought me my first guitar, and through the years Dad taught me to play. I have always wanted to learn to play the banjo, too, but like Dad always said, "If you can't learn the roll, you just can't play the banjo." Though Dad patiently tried many times, I just couldn't get it so I would listen to him play and back him up on the guitar. I miss singing with him and Mom more than I could ever put into words. Dad didn't own many earthly possessions when he died. 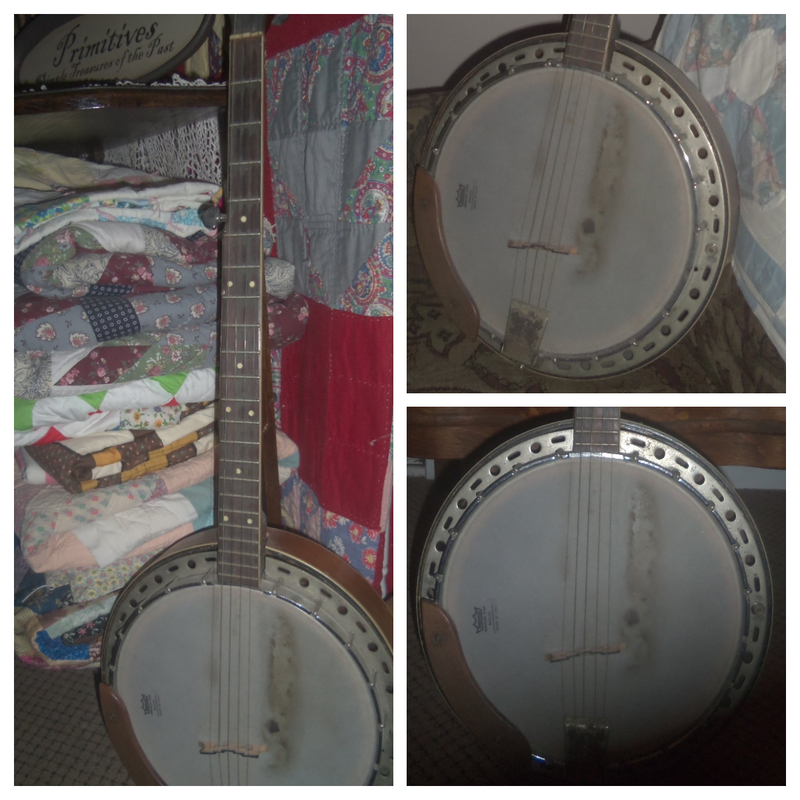 I cherish the few things he left behind, but this banjo means more to me than anything else. Each one of the memories attached to this old banjo means the world to me. I'll close this post with a few of the songs we used to sing and play together. I think one of the reasons we love Blind Pig & The Acorn so much is because they remind us of Mom and Dad and other family members and the precious times we used to have singing and playing music together. They sing a lot of our favorite songs, and they are SO talented! We felt like we had lost a personal friend when Pap passed away not too long ago. Click here to check out their youtube channel! Thanks for reading and listening, dear friends! I'd love to hear about a few of your favorite things, too, should you care to leave a comment! "Be strong and courageous; do not be afraid or discouraged; for the Lord, your God is with you wherever you go." We recently had the special opportunity of meeting the sweet 19-year-old young lady I am interviewing today. I can tell you that she is as friendly, down-to-earth, and kind as she seems during her concerts. You may remember her from "The Voice" Season Nine. I know you will be greatly blessed by her presence here and hope you enjoy getting to know her better! Cheryl: Please introduce yourself and tell us who you are. Cheryl: We would love to hear about your Christian testimony. How old were you when you became a Christian? Were you raised in a Christian home? Emily Ann: I was so blessed to be raised in a Christian home. My mom and dad took me and my sister to church every Sunday and are very strong in their faith. I was in elementary school when I really started thinking about salvation and giving my heart to Jesus. I knew I was a sinner and I knew without asking Him into my life I would spend eternity separated from Him. I was so convicted and knew I needed Him in my life, so in December, when I was in the 3rd grade, I prayed with my parents and asked Jesus to be my Lord and Savior! Cheryl: Who has most impacted your walk with Jesus? Who has mentored you, influenced you, and prayed for you most? 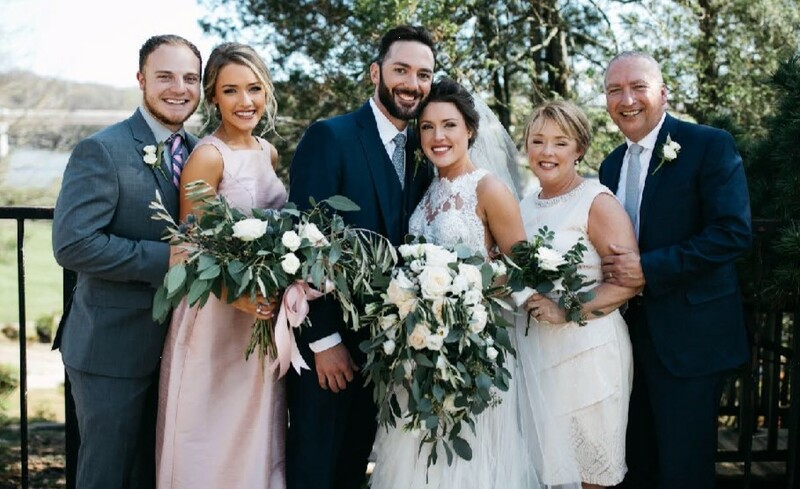 Emily Ann: My Mom has been my biggest influence/mentor in my Christian walk. She prays for me daily and has the sweetest heart for people. My mom just has the perfect way of encouraging me and giving Godly wisdom/advice when I need it most. Cheryl: What about that person do you most long to emulate? Emily Ann: I love how patient and kind my mom is. She is always thinking of how she could help/encourage someone else, and she is always putting others before herself. I hope to be just like her one day. Cheryl: What is your first singing memory? 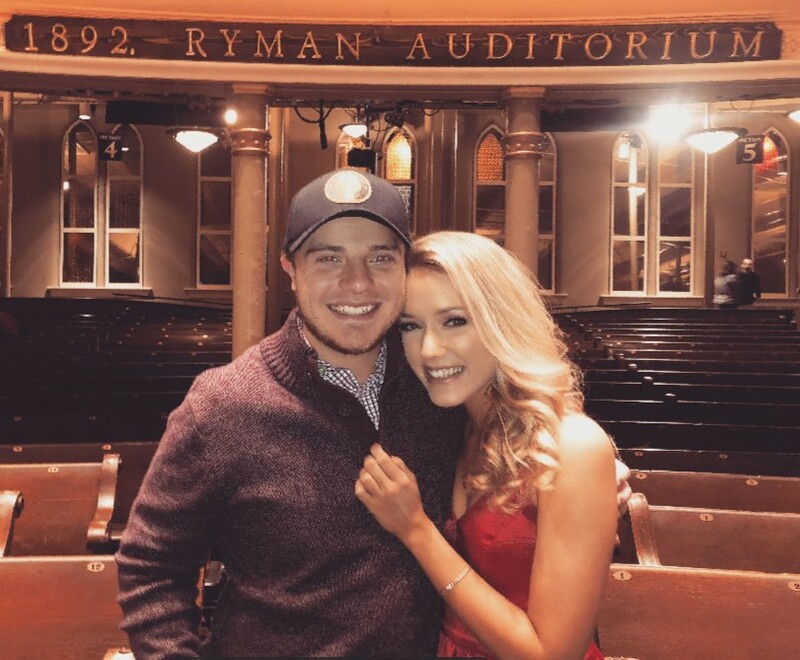 Emily Ann: My first singing memory is riding around in a car seat with my family singing every word to Ricky Skaggs' “Soldier of the Cross” album. Cheryl: When did you realize that God has gifted you to sing and that He wanted you to pursue that gift as a career? 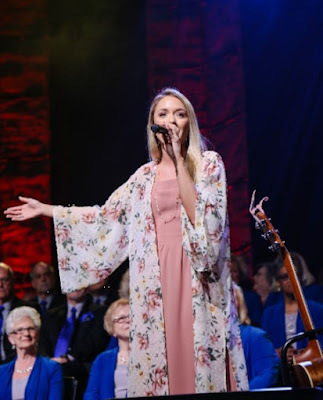 Emily Ann: I don’t think it hit me all of the sudden, but with little things that happened along the way, I became very confident that God had created me to sing. It took me a while to quit overthinking/doubting myself as a singer/artist, but when I finally realized it isn’t all about me and my abilities, but about being obedient to the Lord and confident in the gift God placed inside of me, I became sure that this was what I’m meant to do. The Lord opening up the door to be on "The Voice" was also a huge sign that this was what He created me to do. The doors since then have just flown open. Cheryl: Tell us about your life before and your journey to being a participant on "The Voice." 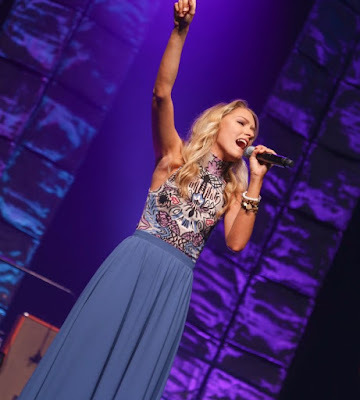 Emily Ann: I sang a lot in Church and around Knoxville in competitions and restaurants before my time on "The Voice." My dad would record videos of me and post them on YouTube, and we never thought anything about it. A casting producer from the TV show saw me singing on YouTube and invited me to come to a callback audition in Atlanta, GA. I never particularly wanted to be on a singing competition show, but since the opportunity fell in my lap I knew I had to at least go audition, and I’m so thankful I did. Cheryl: What was the whole experience of being on "The Voice" like for you? Emily Ann: I cannot say enough good things about my time on "The Voice." The production staff, wardrobe team, hair and makeup artists, camera crew, band, drivers, and the coaches were all so amazing to work with. I most enjoyed getting to know the other contestants on the show with me. We went through a crazy life-changing experience together, and we became family during those months working on the show. I learned so much and was so inspired by the other contestants. Not only were the people great, but the show encouraged me to do things that used to scare me and to step out of my comfort zone. it really made me step out of the “box” I had put myself in. Emily Ann & Ricky Skaggs performing together on "The Voice"
Cheryl: What are some of your most memorable moments during your time on "The Voice?" 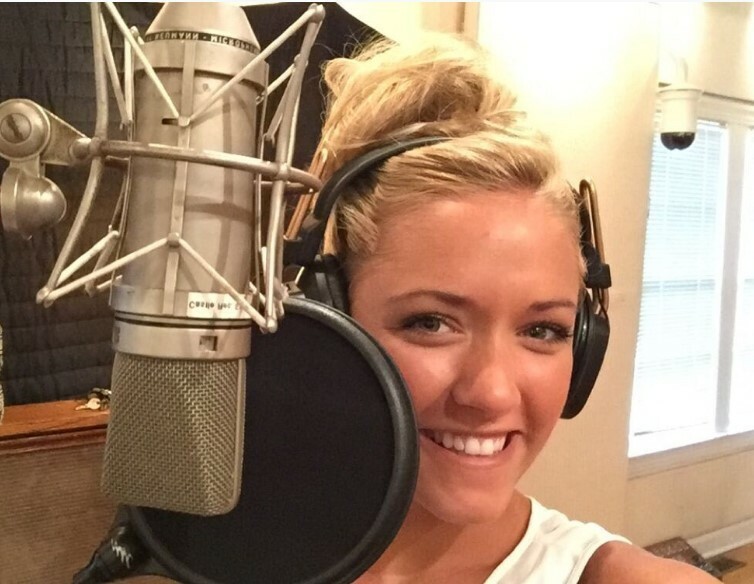 Emily Ann: Honestly some of my favorite times were spent back at the hotel singing songs with the other contestants. We would have “jam sessions” at night where we would just pass the guitar around and sing together. I remember being so overwhelmed and amazed at the talent that was sitting around me. It was so inspiring. Also working with Blake Shelton was amazing. He is so down to earth and normal. He encouraged me so much and truly helped me come out of my shell. Also, he was always just so fun to be around. 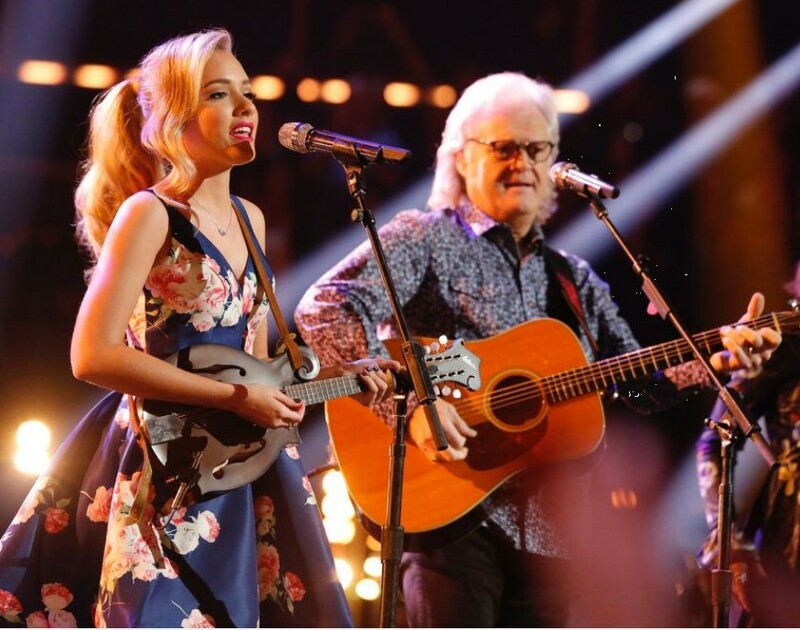 Blake Shelton & Emily Ann performing together on "The Voice"
Cheryl: How did your faith in God and your Christian walk influence and factor into your decisions and conduct while being a participant on "The Voice?" 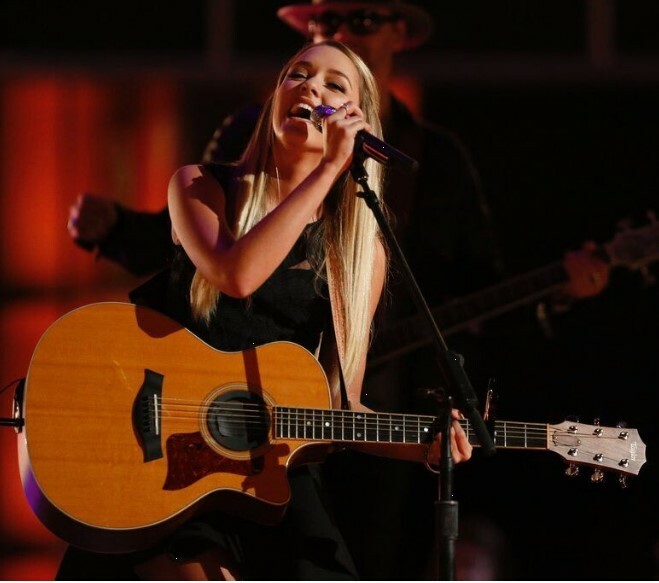 Emily Ann: My faith was the one thing that got me through my time on "The Voice." It was a lot of change and pressure on me as a 16-year-old. It was truly an amazing opportunity, that I wouldn’t trade for anything, but there were a lot of long days and homesick nights. But I knew the Lord had brought me to the show and that he was opening all the doors, so I held tight to the promise that he had good plans for it. I also wanted more than anything to be able to sing a gospel song on the show because I wanted to use the platform the Lord gave me to glorify Him. Thankfully, I was able to sing one of my most favorite gospel songs, “In The Garden,” during the live playoffs. It was amazing to hear stories of how that song touched peoples hearts. I’m still so amazed that God can use someone like me to encourage others and lift the name of Christ. Cheryl: What opportunities have opened up for you as a result of your being on "The Voice?" How has life changed for you? Emily Ann: Blake Shelton introduced me to his management company in Nashville, and I have been working with the team there since I got home from the show. I am so thankful to Blake for making that connection for me. There have been so many amazing opportunities I’ve had since my time on the show. I was able to sing at a Salvation Army Gala in New York City, do the half-time show at Neyland Stadium to honor Pat Summit, make my Grand Ole Opry debut, and play countless shows that have blessed my heart so much. My favorite part of what I get to do is connecting with the people who come to my events. I love hearing their stories and being able to connect with them through music. Another door that opened from "The Voice" is working with Abraham Productions and Ray Flynn Ministries. Ray Flynn saw me singing “In The Garden” on "The Voice" and reached out to have me sing at one of his events. I have been working with him ever since and I’m so grateful to work with him. Ray was the executive producer on my first album “Bigger Than Me,” and without him, I wouldn’t have been able to make the record. As far as life-changing, the main things that are different are how busy I am and people recognizing me out places. When I first got home from the show, it was a huge shock how many people recognized me and wanted pictures and autographs. I was in such a bubble out in L.A., and I was so busy doing the show that we never watched the show. It was crazy when It fully sank in that I had been in peoples living rooms on their TVs for months. Cheryl: What are your dreams going forward? 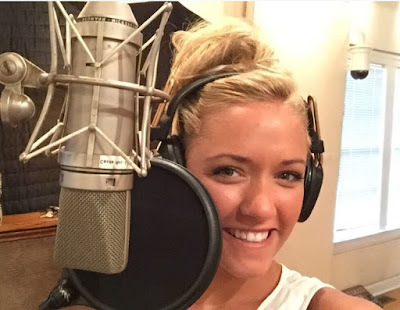 Emily Ann: My biggest dream going forward is getting my country music done and released! I have been working so hard on it for so long, and I cannot wait to share it with everyone. My prayer is that it touches hearts and encourages and empowers every person who hears it. I want my music to inspire little girls who want to be a country music artist one day the way so many albums inspired me growing up. Cheryl: How is God working in your life right now? How is He leading you? Emily Ann: God is showing me in this season of life to take one day at a time. I have to daily surrender my life and path to Him knowing that His plan and timing is far better than anything I could come up with. I’m a fixer, and I am not very patient, but the Lord is showing me that some of the sweetest times are in the unknown seasons of life. when I do not know what the next step is or what tomorrow will look like. It is so sweet to know that God has specific plans for each of our lives, and He loves us and cares for us. Cheryl: Who lays most heavily upon your heart? Who do you most long to reach through your music? 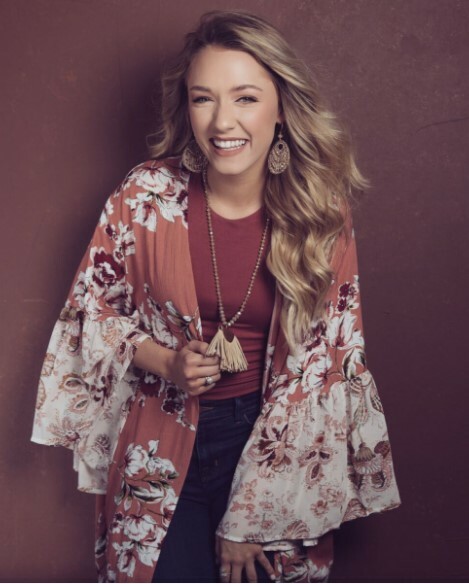 Emily Ann: I would love for my music to reach everyone and encourage all ages of people, but most of all, I would love to make an impact on young people. Middle school, High school, and college are hard years for most kids, and I would love to be a light to them. Whether it's with a song that reminds a girl of her worth or a song that they can turn up on their radio that just makes them happy. I want my music to make people feel empowered and give them hope. I want it to inspire them to follow the passions the Lord has placed in their hearts and give them peace and encouragement in the “in-between” seasons of life. Cheryl: When people come to hear you sing, what do you want them to take away from the experience? Emily Ann: When people come to hear me sing, most of all, I want them to leave knowing they have a Heavenly Father who loves them and wants a relationship with them. I also want them to be able to have a great time. I want for my shows to be a fun, safe place where people can forget about all the stuff going on in their life and just relax and enjoy music. I want them to be able to smile, laugh, cry, feel empowered, nostalgic, confident and loved. I want them to know that if God could use a small town, simple girl like me, then He can use them, too. No dream is too big- if they want to be a doctor or an astronaut, or a teacher, or whatever; I hope by seeing me live my dreams, they are encouraged that theirs can be a reality also. Cheryl: In a culture that is becoming increasingly hostile toward God, His Word, and His cause, how do you remain grounded and firm in your Christian faith? What keeps you steadfast amid strong pressure to be silent about your walk with Christ and conform to political correctness? Emily Ann: I cannot live without Christ and His word. I know that society is against God but I can not stay silent about him. The Lord changed my life and I want everyone to experience the life I have with Christ. My friends, family, and church have kept me grounded through my journey, and I’m so thankful for the support and prayer they give me. Cheryl: What is your advice to teenagers/young people who are striving with all their might to remain true to Christ and swim upstream against such strong opposition? 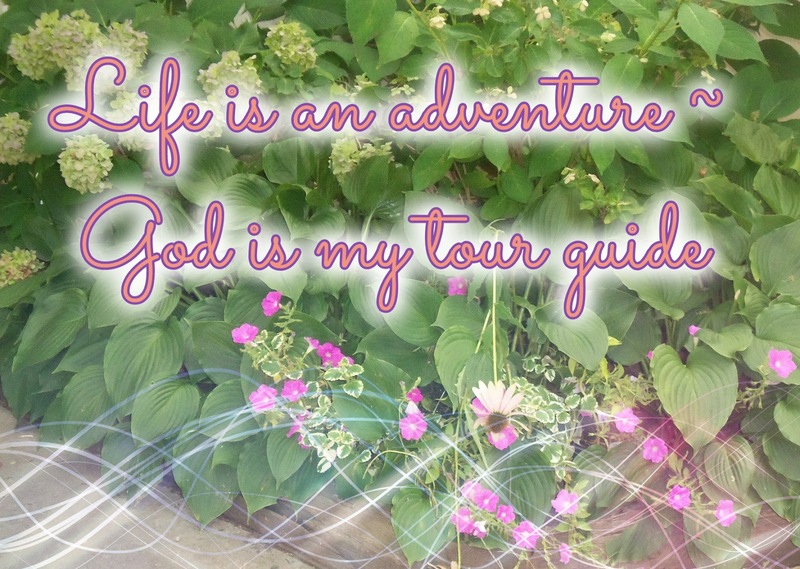 Emily Ann: Lean on God with all you have. He will give you the strength to stand firm against temptation and worldly desires. 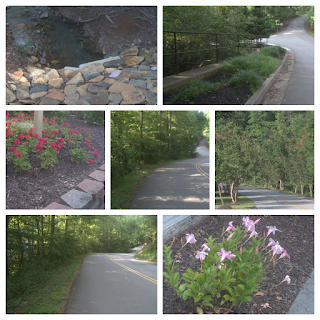 I know it's hard to walk the narrow road, but it is so, so worth it in the end. 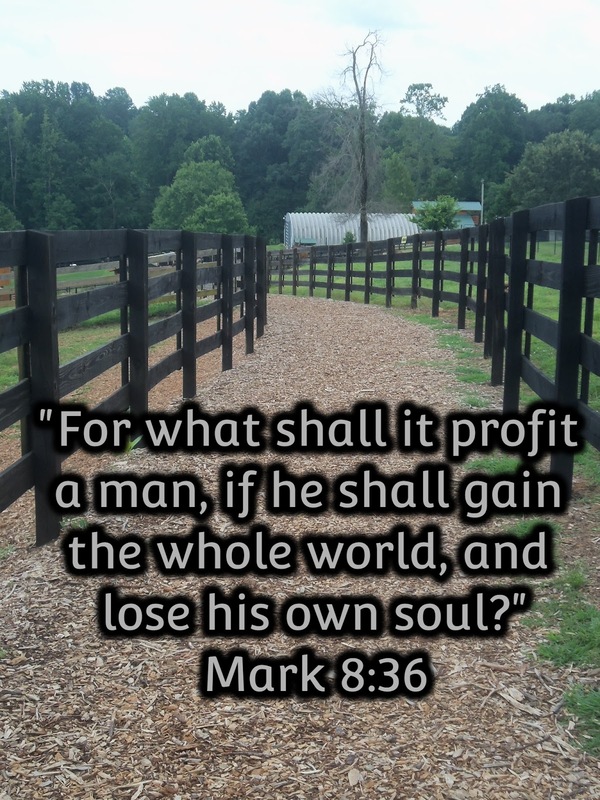 All the things people chase after in this world will amount to nothing but destruction. Christ came to give life and give it abundantly. He is your portion and all you need. He satisfies every longing your heart could have. Keep reading His word and trusting Him in your life. Also, get involved in a Bible study with other believers your age. There is nothing like having friends to read Scripture with you, hold you accountable, and encourage you. Cheryl: Having been a part of your live audience twice, my family and I have experienced first hand the powerful anointing of the Holy Spirit that is present when you sing. Please share with us about some of the most memorable demonstrations of His presence you have witnessed during your concerts, thus far. Emily Ann: It always amazes me how the Lord moves when we let go and let him have his way. The Lord has moved so much during the events with Abraham Productions. There is nothing like looking out at a group of believers with their hands lifted toward Heaven, praising the name of Jesus and knowing I get to have a part in that. Seeing chains break and walls fall down is the most amazing part of what I get to do. Music is so powerful, and the Lord has shown His power through it countless times with people coming to know Him at the events. Cheryl: When do you feel most anointed by God while singing? Are there particular songs that consistently bless and move you and your audience into a special time of intimate worship? Emily Ann: I feel like God uses different songs in different seasons, so it varies which song I feel blesses me and the audience the most. As far as when I feel most anointed, I truly feel like God uses me most when I fully lay down everything and just worship Him. I try not to worry about the words or the notes but focus on my heart and on worshipping Him. Cheryl: Please tell us about your CD. What songs are on it? What are your favorite songs to sing? How can we buy it? Emily Ann: My CD is called “Bigger Than Me,” and it came out last August. It is a mix of old hymns, current songs, and a few original songs written by myself and some of my co-writers in Nashville. My favorite songs to sing off my album are “This Blood,” “I Know Who Holds Tomorrow,” and “Bless This Mess.” Unfortunately, the only way to purchase one of my CDs is to come to my shows. We do not sell this album digitally. Cheryl: How can we pray for you during this season of your life and career? Emily Ann: Please pray that I am able to reach the people who need encouragement and the truth most and for strength, peace, discernment to know where God is leading me. Thank you ever so much for sharing your time and inner views with us, Emily Ann! May God continue to bless you and use you and your music ministry in new and powerful ways! Thanks so much for reading, and please keep Emily Ann in your prayers, dear friends!